Don Williams has been involved in the classic car hobby for some 50 years. He has owned many of the world’s finest classics, some of them multiple times. Don Williams has been involved in the classic car hobby for some 50 years. He has owned many of the world’s finest classics, some of them multiple times. In 1981, he established the Blackhawk Collection. 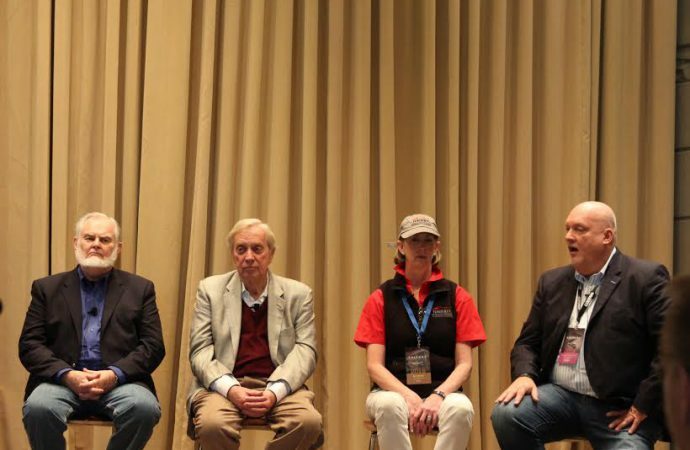 Saturday, Williams was one of the panelists in the Phoenix Automobile Press Association’s seventh annual Arizona Auction Week Preview, which is part of the Arizona Concours d’Elegance weekend at the Arizona Biltmore resort. He was asked about his advice for newcomers to the hobby. Dave Kinney, long-time vehicle appraisal expert and publisher of the Hagerty Price Guide, suggested that buyers also need to add some practicality to their emotional decisions. “It’s important to be practical,” he said, explaining that you need to be sure you fit comfortably into a car before buying it. He also stressed the importance of learning about a vehicle before shopping, and suggested potential buyers join a marque-specific car club and ask questions. “Cars won’t make you happy unless you let them and want them to,” Kinney said. The panelists talked about the generational shift taking place within the hobby as Baby Boomers age and sell their cars. Williams said he learned as a very young classic car salesman that the hobby’s primary demographic is the 40 to 60-year-old group, and that means a generational shift every 20 or so years. Great cars, he said, will always be great but, he added, each generation has its own idea about what cars it finds nostalgic. Getting future generations involved in the hobby is something Diane Fitzgerald does. She’s the national director of the Hagerty Education Program based at the LeMay, America’s Car Museum. She said exposure can be key in that regard, and is encouraged that she sees shop classes returning to some schools after such programs were dropped a decade or more ago. “Car guys are teaching and restoring classic cars, car clubs are engaging the young people with these projects, and there is a resurgence of interest at state and municipal levels,” Fitzgerald said. However, she lamented that the hobby needs to do a better job communicating with school guidance counselors about career opportunities and the facts that there are two- and four-year degree programs in automotive restoration. One of the other barriers she encounters, she said, is that “well-educated parents with college degrees who don’t want grease-monkey kids. Kinney also noted that the millennial generation of car enthusiasts doesn’t tend to be either joiners or followers and tends not to participate in clubs other than local ones that are based on young participants. However, he added, “cars and coffee” events are getting young people involved in the classic car community and exposing them to various automobiles. Williams traced the growth of Arizona Auction Week to the long history of the Barrett-Jackson auctions in Scottsdale and he and Kinney pointed to television exposure for Barrett-Jackson and Mecum Auctions for spreading interest in the hobby to a much wider audience. Kinney, who travels to classic car gatherings across the country and even in Europe, said Arizona Auction Week is second only to Monterey in importance. Also on the panel was John Carlson, president and chief executive of the National Association of Automobile Clubs of Canada and chief judge for the Arizona concours. He explained how concours judges examine the cars, the importance of originality and that ultimately the judges seek the car with the most presence and the most elegance as their best of show.